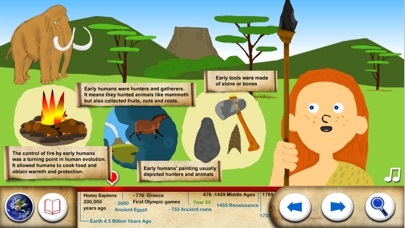 Travel back in time and get an overview of the major time periods and events in world history with History for Kids, an animated eBook narrated by kids for kids. 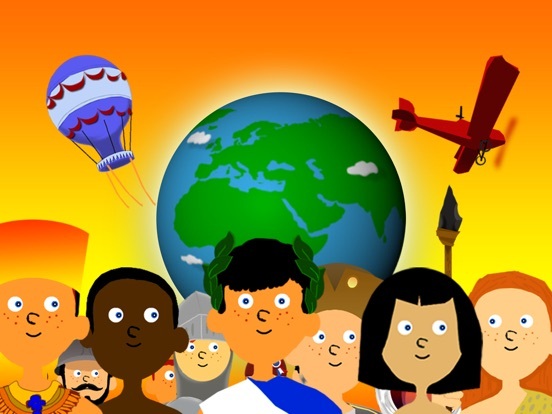 From early history to the first man on the moon, History For Kids takes kids on a tour of some of the major events in world history. 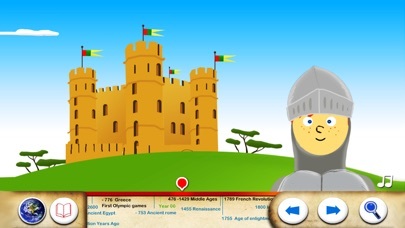 This animated, interactive ebook features kid narrators reading a short book about history and pop-up facts about each major period. Some of the periods covered include the beginning of the Earth, the first humans, the foundation of Rome, and the French Revolution. 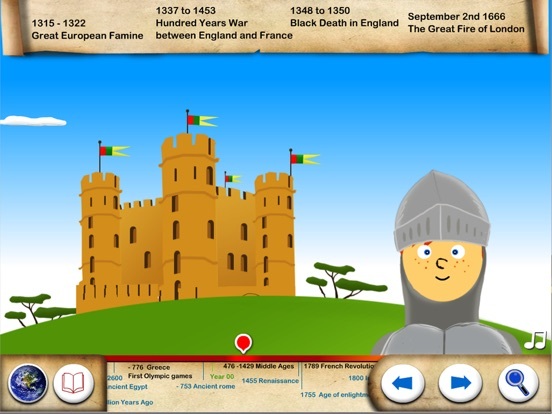 While the app lacks a bit of polish and does not have the quality of similarly priced apps, it does offer a fun way to get kids interested in history. The main issue in the app is its quality. While it offers features such as icons to help kids navigate from page to page, audio narration, and interactive animations, many of the elements come with rough edges. For example, the text and fact boxes on the screen often awkwardly cover some of the illustrations and can occasionally be difficult to read. If kids opt to listen to the narration, they’ll notice that the kids’ voices do not always move in sync with their lips and their lips often keep moving long after the narration has ended. Some of the interactive illustrations have issues too. For example, a play button directs kids to start the volcano, but does not disappear once the lava starts flowing, causing a distraction and partially covering the lava flowing on the screen. 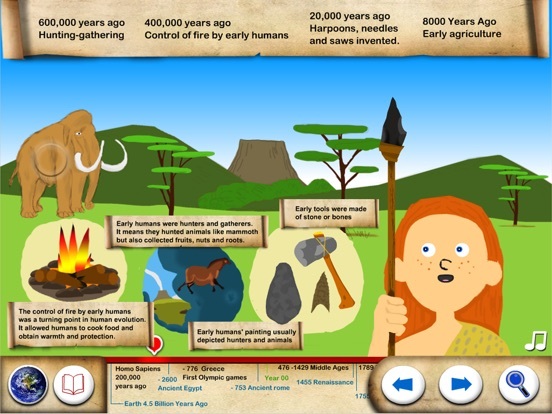 Features such as the timelines at the top and bottom of the screen and instructions screen show that developers want the app to be educational and easy for kids to use. They simply need to spend a little more time refining its features to make it a top-quality app. 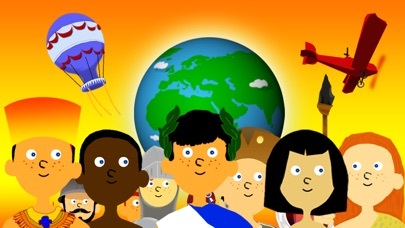 This book takes kids on a journey through the major events of history. Each page contains a basic overview of the period. 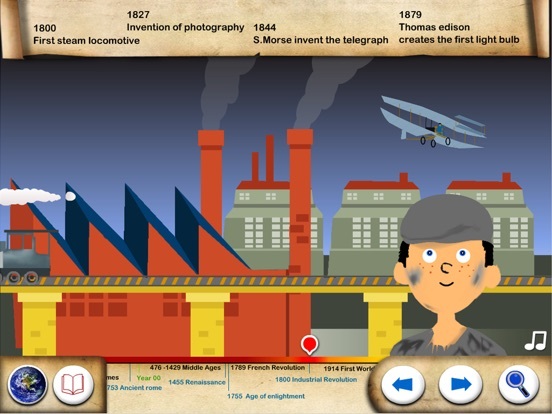 Kids can then tap on the magnifying glass to display more specific facts. Some of the pages are loaded with additional facts, while others only offer one or two pieces of information. 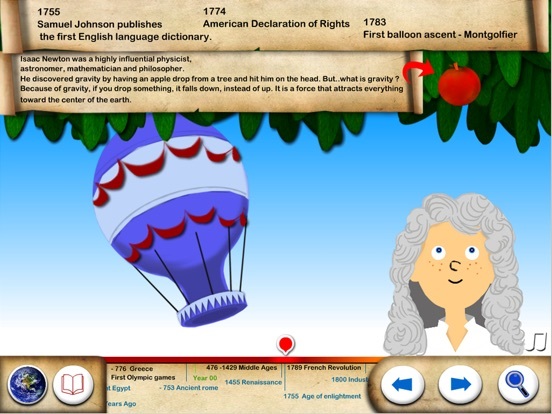 Kids can tap to hear the narrators read the text on each page and/or tap on the open book to display the text on the screen so they can read along. The text does contain a few errors, such as plurals missing the final -s, which kids may point out. As kids read through the book, they’ll find a few interactive illustrations hidden within the pages. 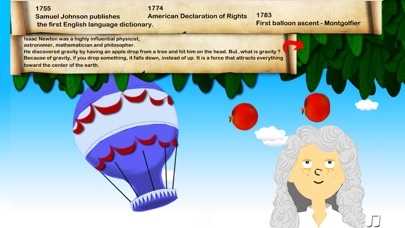 For example, they can erupt a volcano, make a balloon float through the sky, and drop an apple on the narrator’s head. There are also sound effects spread throughout the story that relate to the content. While the illustrations in the story lack a bit of polish, they’re designed to be very kid-friendly, using bright colors and styles that will help get kids interested in the story. Even though the app contains a large amount of information, it is priced higher than your average ebook. Add in the lack of polish and this app would be a much better value at a much lower price point. 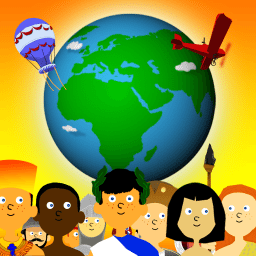 Still, homeschool parents or teachers looking for something different to spice up their history curriculum may find it is worth a download. Icons are clearly displayed to help kids move from page to page. All of the information contained within the app is child appropriate. There is a non-protected parent information page that simply contains basic developer information and an image displaying more apps to purchase. However, there are no active links within the app.